I noticed the GNUK project had support for the STM32 Blue Pill. I've been looking for an open source hardware key storage for GPG/SSH keys, so I tried it out. GNUK supports the OpenPGP smartcard protocol, and has space for 3 keys. The keys are named: "Signature key", "Encryption key", and "Authentication key". There's a few places that sell the hardware+software as a keyfob solution: FST-01, and Nitrokey Start. These are the flags I used to configure. Note that the vid+pid I used are available only for private testing. To flash the new binary to the Blue Pill, I used ST's ST-Link utility and ST-LINK/V2-1 hardware. I already had an arm-none-eabi-gcc toolchain installed. I followed these instructions to setup my new key: gpg configuration, key generation, key import, and set card PIN. After that was done, my gpg-agent had a SSH agent socket, but my environment wasn't pointed at it. Then all I needed to do was put that line into my .ssh/authorized_keys file. Moving the USB device to my Windows machine, I followed these directions: GPG4WIN and Pageant. I also wanted to use cygwin ssh, so I also installed ssh-pageant from cygwin's packages. 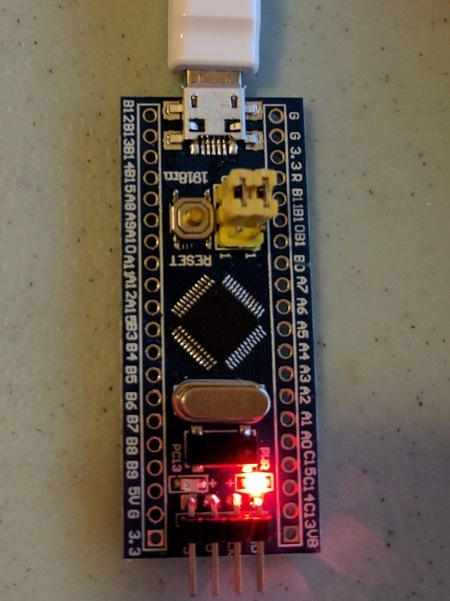 I had to import the public keys into GPG4WIN, and then run gpg2 --card-status to get it to associate the private keys on the stm32 with the public keys in gpg. Once I did that, the Kleopatra windows app let me sign and encrypt files. Pro: the keys are much safer than on disk. They are stored AES encrypted on the flash of the stm32, with the PIN used to generate the AES key. In order to read the flash of the stm32, you'd need physical access to the chip. Disabling flash readout via SWD would make a physical attack even harder. Pro: PIN brute force locks out the smartcard interface after 3 failures. A separate password can be setup to reset the lockout.